Im'Anitas are roughly humanoid with a skeletal, biomechanical, or insectoid appearance. They possess an exoskeleton, and a segmented, prehensile tail that, possesses a bladed tip. This tail can be used to stab or immobilize prey. Typical adults (born from human hosts) are about 7 feet 2 inches (2.18 meters) tall. They have a hard outer shell which is usually muted shades of black, bronze, or blue. They have an elongated, cylindrical head but possess no visible eyes. Im'Anitas have long, sharp claws on the tips of humanoid fingers. Encounter survivors have reported them as having variously four or six-fingered hands. The first and second fingers are joined together as well as the third and fourth, also have a second thumb on the lower edge of the hand. Their mouths contain another set of jaws. This second set of jaws is located at the tip of a tongue-like proboscis inside the mouth. The Im'Anitas tongue can become rigid enough to penetrate bone or body armor with the secondary jaws at its tip. It is employed almost exclusively as a weapon to incapacitate prey, usually through head trauma. Im'Anitas blood is an extremely potent acid and is capable of corroding on contact almost any substance with alarming speed. Even the unknown metal used by the Ut'Ja, which is almost invulnerable to any human construct has been shown to melt on contact with the blood. The acidic blood is highly pressurized within the xenomorph's bodies, and any piercing or puncturing wound causes it to violently spray out in all directions, causing harm to anything alive in the vicinity. The exoskeletons of the creatures themselves are impervious to their acidic blood. Im'Anitas can produce a thick, strong resin, which they use to build their hives and cocoon victims. Much like termites, they mix their viscous saliva with solids. It shows amazing heat and moisture-retaining qualities. They also salivate profusely. This saliva is acidic, though not the same extent as the blood, and can be used to blind victims, much like a spitting cobra. The adult Im'Anitas is basically a living weapon, noted for its ferocity and deadliness in any condition. Once fully matured, they have great physical strength and agility. They are masters of stealth; a favored method of acquiring prey is to simply wait in a dormant state until an appropriate victim strays near and then drop down silently from behind. The prey is generally blind to the fact that a Im'Anitas is present, due to its propensity to camouflage itself within its nest walls or the surrounding artificial environment given its biomechanical appearance. Im'Anitas appear to possess intelligence roughly similar to that of a typical predatory mammal. 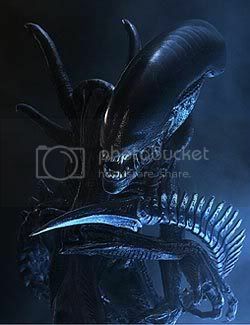 Although they do not demonstrate human-level intelligence as a species (such as abstract reasoning, language, introspection and technological advancement), their queen appears to possess considerable acumen in its social behavior and manipulation of human technology, and the technology of other species as well. In the rare event that a Im'Anitas should find itself under attack or otherwise vulnerable, it once again displays incredible creativity and cleverness. They are quite capable of moving quickly in ventilation systems, despite their size, and will use such conduits for ambush, escape, or simply as an easy way to travel between areas. Im'Anitas are conscious of the effects of their acidic blood, and will use it to their advantage, such as breaking out of human constructed confinement, or use it as a weapon. Im'Anitas, in all stages of their life cycles, have been said to have vulnerabilities to heat, although this has never been proven. High energy beam weapons, such as plasma weapons or Phasers appear to be the best way to kill or destroy the Im'Anitas. They are not invulnerable to melee weapons such as a Klingon Bat'leth, although such equipment is likely to be destroyed upon contact with its acidic blood, projectile weapons such as the SFMC Gremlin Pistol are effective but a rather crude weapon to use against a Im'Anitas. The Ut'Ja seem to be the only race capable of taking on this immensely dangerous species. AVOID CONTACT AT ALL COSTS. ANY OBESERVATION SHOULD BE DONE AT A DISTANCE!